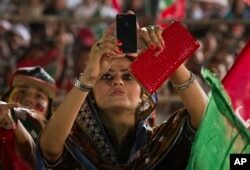 FILE - A Pakistani student uses her mobile phone to take a picture of her friends holding banners prior to a protest in Islamabad, Pakistan, Dec. 19, 2014. Some activists say that the Pakistani government has been silencing critics by selectively reporting their social media posts to platforms like Facebook and Twitter as unacceptable content. Back in January, when a human rights activist Gul Bukhari tweeted pictures of a dead body, which seemed to have torture marks on it, to challenge the local police’s narrative that the death was natural, Twitter changed her settings. “Effectively my voice had been muted,” she said. She found out about the change from her followers who complained that they could not view the content she was sharing with them. In a subsequent email, Twitter told her that her account was reported, without telling her who reported it. She was allowed to change her settings back to normal with a warning that if she continued to tweet sensitive images, she would not be able to reset again. While Bukhari continues to tweet on issues, she now has to be careful with her choice of words or images. “Going forward I do have that sword hanging over my head,” she said. In a country like Pakistan where mainstream media often gives in to pressure to avoid certain issues, social media platforms like Facebook and Twitter are seen by activists as tools to fight back. However, digital rights activists complain that space on these avenues is shrinking due to exploitation of their policies either by the government or other actors trying to muzzle free speech. On Tuesday, the Twitter account of a young activist Manzoor Pashteen, who seems to be facing a blackout on mainstream TV channels due to his anti-military rhetoric, was temporarily blocked. While the published guidelines by most social media sites are seemingly clear as to what is considered unacceptable content, the descriptions become murky when dealing with issues like the one Bukhari faced, in which the image of a dead body with alleged signs of torture, something that could fall under Twitter’s graphic content definition, was an effort to point out possible human rights violations. The ambiguity, activists complain, allows room to censor political dissent or legitimate free speech. FILE - A woman uses her cell phone to take picture during a protest near the parliament building in Islamabad, Pakistan, Aug. 25, 2014. In addition, governments can request these platforms for removal of content based on local laws. Facebook’s most recent transparency report, for example, show that it restricted 177 pieces of content at the request of Pakistan government between January and June 2017, up from only six in the preceding six-month period. “Based on legal requests from the Pakistan Telecom Authority and Federal Investigation Agency, we restricted access to items that were alleged to violate local laws prohibiting blasphemy and condemnation of the country's independence,” Facebook said in its report. Activists say the government has introduced vague terms like the “glory of Islam or the integrity, security or defense of Pakistan” into a controversial cybercrime law passed in 2016, which are then used to censor criticism or political dissent. “The problem is that neither PTA (Pakistan Telecommunications Authority), nor the social media platforms disclose the reasons for blocking a user or some content. It’s all very opaque,” said Haroon Baloch of Bytes for All, a digital rights group based in capital Islamabad. His group monitors social media closely using digital tools. They write to the appropriate platforms when they think legitimate speech has been censored, and sometimes get relief. “They do try to keep human rights activists on board,” he said. Still, he believed, sometimes government pressure and business concerns won. In 2016, Google opened YouTube again in Pakistan after a ban of several years when it offered a Pakistan-specific version of the service which removed the content the government considered blasphemous. Farieha Aziz, the director of a digital advocacy group Bolo Bhi, which literally means “speak up” in English, is against such tailoring of content. “Foreign platforms restricting some pieces of content, so that their entire website doesn’t get shut down, is similar to our corporate media censoring and self-censoring to keep shop open,” she said.